More chances for showers and thunderstorm are on its way, after severe thunderstorms and tornado-warned cells caused damage across areas of Central Texas on Saturday. One tornado was confirmed near FM 2269 and 22nd Street in Cameron, Texas, according to the Milam County Sheriff's Office. There are no confirmed reports of damages or injuries. Cloudy skies and spotty showers of rain are still expected Saturday night and will pick back up again Sunday morning. 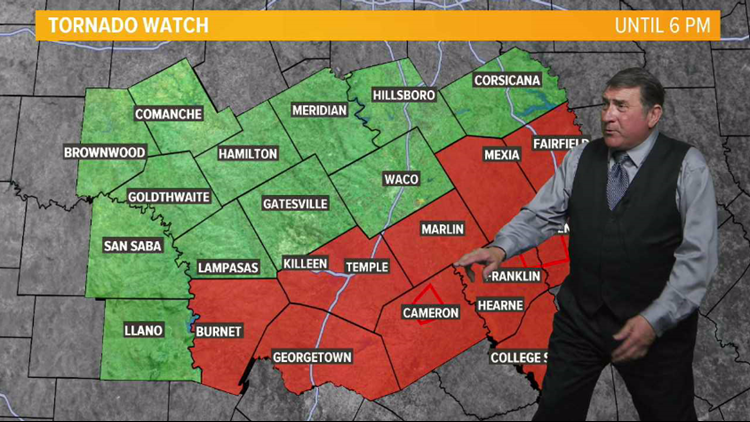 Chief Meteorologist Andy Andersen said counties along Interstate 35 will remain in an enhanced risk zone for severe weather Sunday, with a high chance for damaging winds. There is also a medium-level threat for damaging hail and flooding. As always, you can expect more updates this weekend from the KCEN Channel 6 weather team. Never get caught in the rain. Download the KCENTV app now. Got weather photos or videos to share? Visit our Facebook or Twitter pages.